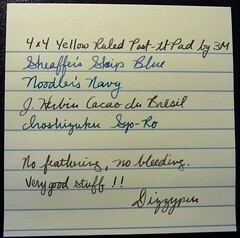 Since I’m avoiding doing my work and since someone posted a topic on FPN about being unable to find Fountain Pen Friendly Post-It Notes I thought I’d post a quick and dirty review of these. I love post-it notes and use them pretty much everyday. On my desk I always have one of these 4×4 Yellow Ruled Post-it Note pads. I’m not sure about every other type of Post-It and I’m not sure about quality control on these, but the ones I’ve used are exceptionally FP friendly. In fact, the paper out performs many other cheap papers I’ve tried despite the fact that it is lightly coated. Drying time is a bit extended (probably because of the coating). The lines do not absorb ink as you can see in the photo. What a great idea to do mini reviews of post-it friendly inks! Super! I somehow missed this post until now – my bad! Thanks!!! That’s not exactly what I was going for but I’m glad you like it. All my inks work on this particular type of post-it not just those four. That’s just what I had inked.